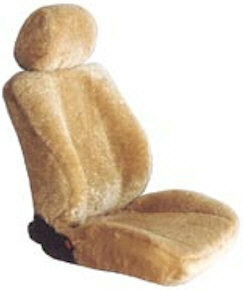 Called "Super-fit" because elastic "look-a-like sheepskin" material hugs the sides and back of the seat back. They slide down over the seat back like a slip cover. The top and bottom of the seating surface, (the areas your body touches) is covered with 100% real sheepskin. If your seat has a headrest, simply remove it and slice an opening with a razor blade and slide the headrest back in. Available in the same eight colors as the Super-fit High Back seat covers. Made of Soothing 5/8"-3/4" thick genuine sheepskin. Fully cloth lined. matching seatbelt strap covers $13.99 each Click the "Buy Now" button to enter Make, Model & Year of your vehicle.